With the end of the Battle of the Bulge, Germany was compressed into their own country, Allies were to meet on war ending strategy. All of the big islands of the Philippines have been invaded, fighting to continue till the end. Forces gathering for Iwo Jima. Feb 1 . US/UK conference at Malta. Feb 2 . Japanese 12th Area Army was formed to defend Toyko. Eighth AF raids over Europe with over 1,200 B-17's and B-24's with around 900 fighters in support. Feb 4-11. Yalta Conference begins -- US, UK, USSR -- discuss end of war. Feb 4 . 100 B-29's from India attack Japanese Home Islands: Kobe and others. Feb 5 . 60 B-24's deliver heaviest attack yet on Corregidor. Feb 6 . 27 B-24's hit Iwo Jima. Feb 7 . Five separate submarine attacks sink enemy shipping; underseas war in full swing. Feb 8 . TF 92 sorties from Attu, bound for Kuril Islands north of Japan proper . Feb 9 . German submarine U-864 off Norway on a mission to supply Japan with advanced weapons technology. Feb 10. Suicide swimmers attack survey ship Hydrographer (AGS-2) at Palaus harbor. Feb 11. Yalta Declaration -- USSR to enter Pacific War 90 days after the end in Europe. TF 58, including 15 carriers, 8 BB, 15 CA, 77 DD, steams toward Japan. Fletcher had 3 carriers, 0 battleships at Midway 3-years earlier. TF 92 encounters heavy weather and retires to Attu. Feb 12. B-29's and PB4Ys begin reconn for TF 58 steaming to Japan as Navy preempts for Iwo Jima. Feb 13. 35 B-24's from Saipan fly strikes against Iwo Jima. 1,300 B-24's and B-17's attack marshalling yards in Germany. More than 500 more attack Austria. That plus fighters is a lot of airplanes. Feb 14. Minesweeper and 2 support craft sunk, 4 DD damaged by shore fire near Corregidor. 722 RAF and 527 USAAF heavy bombers fire-bomb Dresden with 4 kilotons of explosive and incediaries. FDR and Saudi King meet on a ship in the Suez Canal ; U.S. to protect the Saudi royal family in return for access to Saudi oil. Feb 15. Army land at Mariveles Harbor of Bataan Peninsula. 100 Marianas-based B-29's bomb Mitsubishi aircraft engine works at Nagoya. 1,000 Heavy bombers conclude attack on Dresden ; 25,000 causalties. TF 58 (Mitscher) attacks Tokyo area to destroy aircraft; claim 340 downed to 60 lost. Sea and air forces begin three-day prelanding bombardment of Iwo Jima, Volcano Islands. Battleships AR (BB-33), NY (BB-34), TX (BB-35), NV (BB-36); and other ships join up from European theater. 3 ships and 11 craft damaged. TF 58 repeats attacks in Tokyo area to sweep aircraft, bomb aircraft factories. Five Japanese ships sunk in separate air attacks. Feb 18. 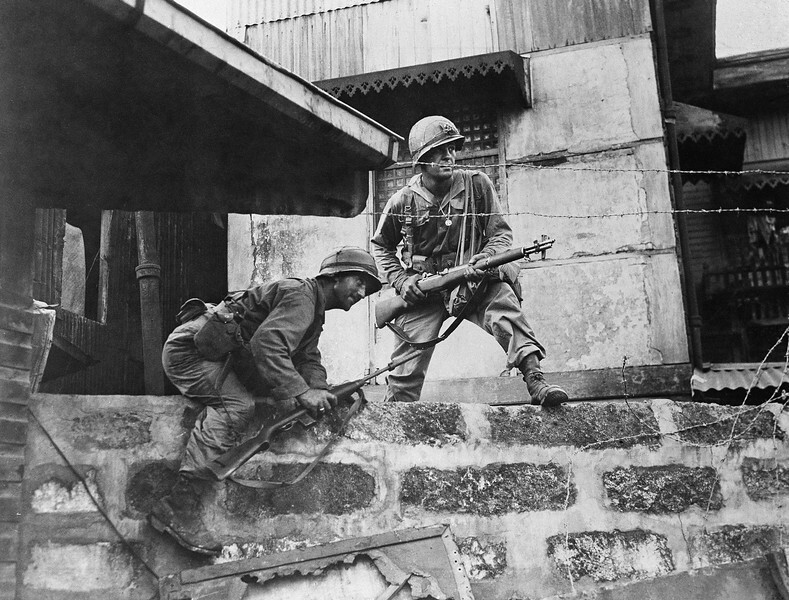 American forces enter Corregidor. Feb 19. 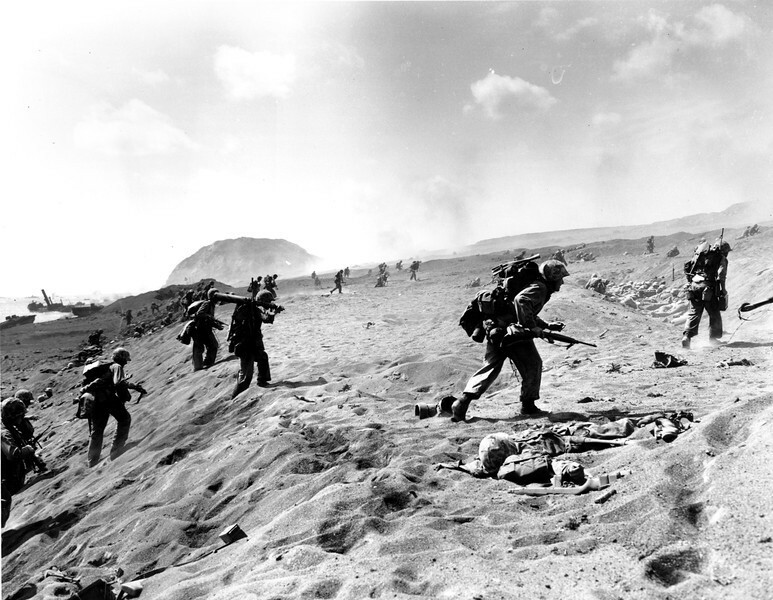 30,000 Marines invade Iwo Jima -- 2000 casualties on D-day. Many collisions among ships; shore batteries hit landing craft. 150 B-29's bomb Tokyo to draw off defenses from Iwo Jima. Army troops land on the NW Samar. Feb 20. Air dropped mines begin to take effect on Japanese coastal shipping - 2 ships sunk. Renshaw (DD-499) torpedoed. She survived, going on to win battle stars: WWII, 8 ; Korea, 5 ; Vietnam, 6. Hospital ship Samaritan (AH-10) hit by friendly fire. Langley (CVL-27) bombed. Multiple collisions. Feb 23. Flag raising on Mount Suribachi. 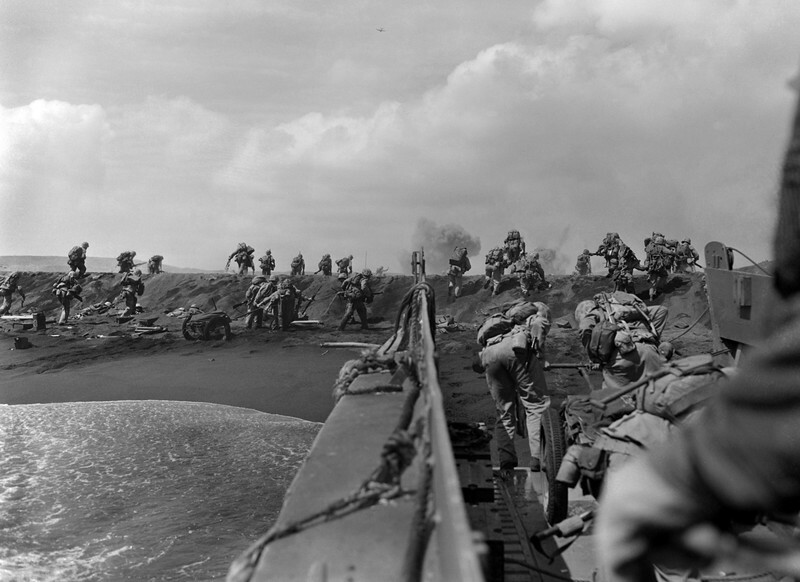 Shore batteries damage landing ships off Iwo Jima,. Submarine, air, and mines destroy enemy shipping. Feb 24. 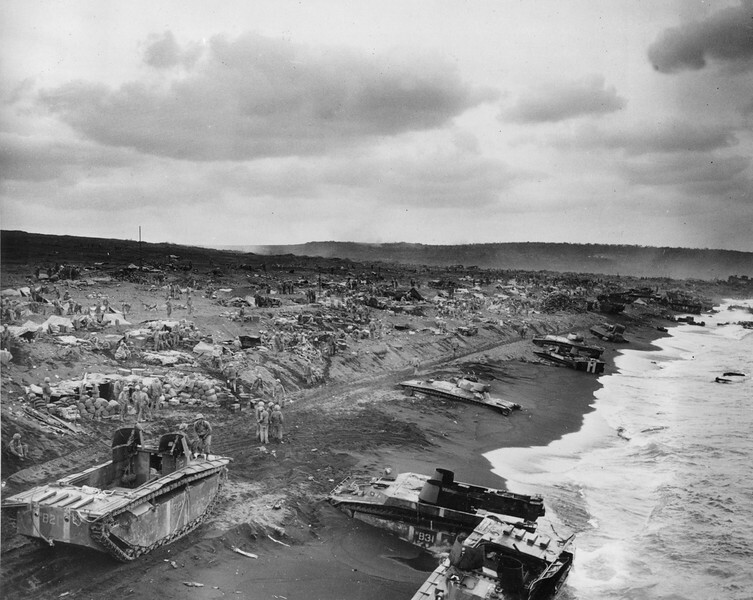 Heavy weather, gunfire, and collisions damage several ships at Iwo Jima. 105 B-29's in an all-incendiary attack, hit Empire Dock area of Singapore, burning out about 40 per cent of the warehouse area. This is the last 100-aircraft strike from Calcutta, India. Feb 25. Manila freed. 200 B-29's and 1,400 carrier planes attack Tokyo. Feb 26. Storms and collisions damage 2 cruisers and 6 destroyers off Iwo. Feb 27. Collisions damage San Jacinto (CVL-30) and 8 other ships. Ten B-29's of 20th Air Force mine Johore Strait. 20th AF B-29's begin shipping out of Calcutta for Tinian and Guam. Feb 28. Army troops land unopposed on Puerto Princesa, Palawan Island. Massacre of POWs. 10th - China/Burma MB, FB. flown into China. 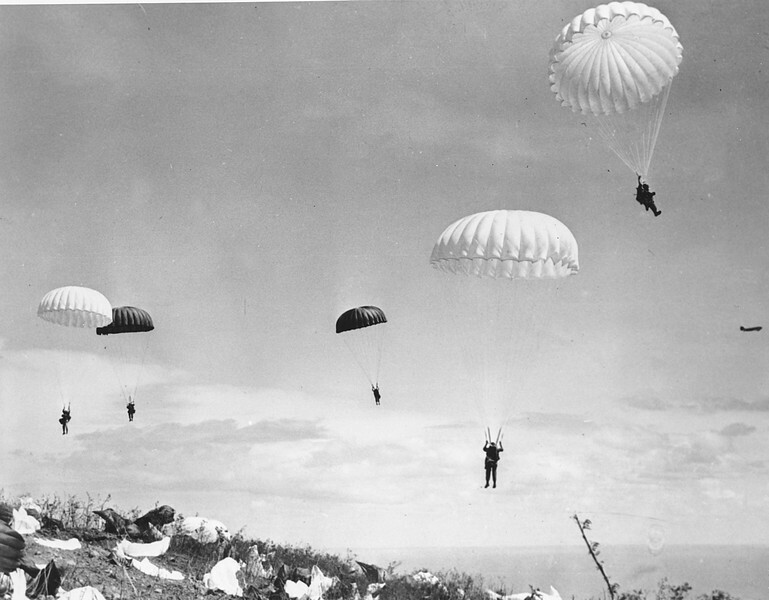 Japanese advance threatening Kunming required other supplies.